*This post is sponsored by Online Fabric Store. All opinions are 100% mine. 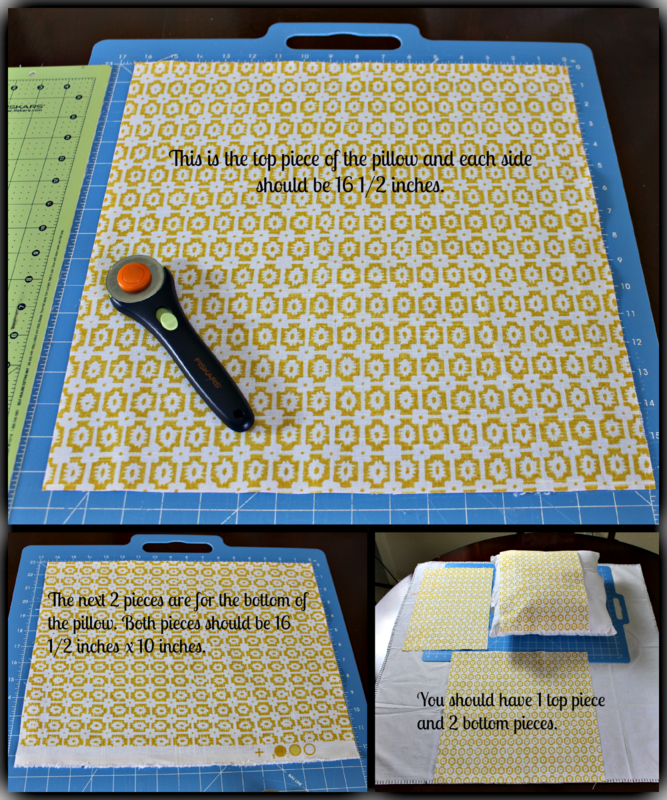 Today, I am excited to be joining 18 other bloggers on creating pillows for your home. Thank you to Online Fabric Store for sponsoring this tour and providing us with the fabric and pillow insert. I have known about the Online Fabric Store for 2 years now and have ordered from them in the past. I love the quality of the fabrics, the different styles, tons of colors and patterns, trims, burlap and so much more. They even carry ready made decorative throw pillows. 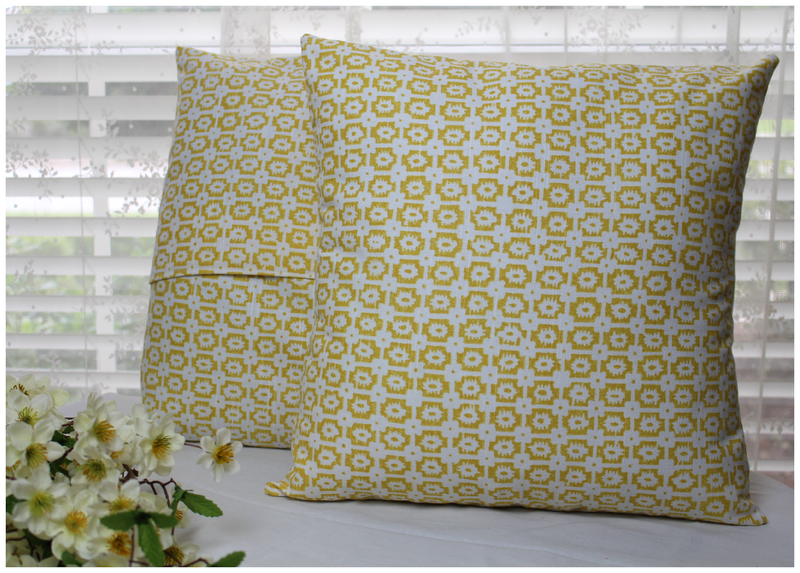 For my pillow I went with a pattern , it's called the Braemore Paloma/OXF Sunflower. Love! This is the pillow form I received. What I love about this one is there is a zipper and you can add more stuffing to it if you want. *Before you cut and pin your fabric remember to line up your patterns. The patterns should be going in the same direction. In this first picture, you need to cut your fabric in the following order. The top piece needs to be cut and measured 16 1/2 inches on each side. The 1/2 inch is for seam allowance. The bottom 2 pieces are going to overlay each other slightly, so you take your fabric and cut each piece 16 1/2 x 10 1/2. The bottom left picture you see all 3 cut pieces. Take your two bottom pieces and fold over once about 1/4 inch and iron flat and fold over a second time and iron flat. Now pin the fold in place (left pic). This part I forgot a picture of but once you have pinned the 2 bottom piece in place, just simply sew down the middle of the fold. Once you have sewed the two pieces, iron these two pieces and now you are ready to pin these two pieces to the top piece. 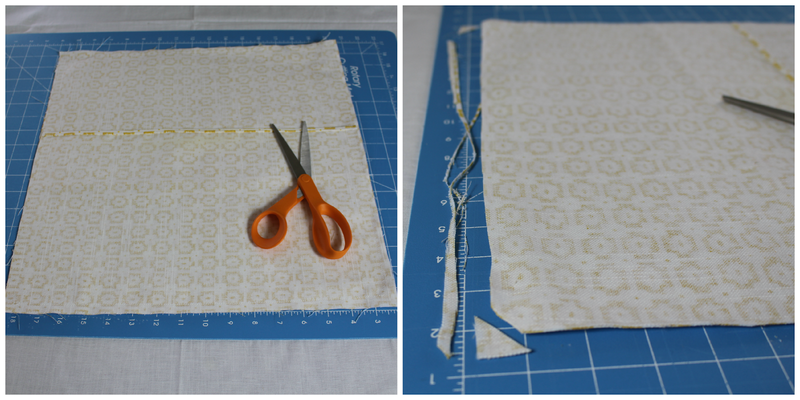 Placing your top piece of fabric right side up and take one of your bottom pieces and pin right side down. As you can see in the picture on the right, the folds of the 2 pieces should be in the middle. Pin the second bottom piece over the first bottom piece (remember these 2 pieces will slightly overlap each other) and it should look like the picture on the left. The picture on the right shows the 3 pieces all pinned all around. Now you are ready to sew the entire square with a 1/2 inch seam allowance. Once you have sewed the pillow you need to trim the corners and sides. This helps keep the pillow from being bulky and those corners sharp . As you can see from the picture on the right, I cut each corner diagonal and trimmed some on the sides. When you are done trimming, iron the pillow inside out. When you are done, turn the pillow right side out. Take a wooden dowel rod (something with a point but not sharp) and poke the corners out. There you have it, the finished product. You can see the front side (pillow in the front) and the back side (pillow in the back). I love making pillow shams. Now we are giving away Two $100 gift cards to Online Fabric Store! Fun! Enter below for your chance to win. Don't forget once your are done entering the giveaway, scroll down and visit my other friends in the tour. Visit my buddies on the tour….it’s happening all week…you can find the links here anytime….tour at your leisure! Wonderful tutorial! I wish I didn't have such a hate hate relationship with my sewing machine. lol...Maybe it's time to buy a new one and give it a try. I love that your pillow form has a zipper so we can add more stuffing too, thats great! Love the pretty patterned fabric you chose Vanessa! Excellent tutorial my friend! I love your pillow Vanessa. We both made covers with the opening flap. I love that design don't you? The cover can be removed and washed or the cover can be replaced with the seasons! Love your fabric choice too. Great pillow and great tutorial! Thanks! I have got to try this! Great tutorial & love your pillow! Nicely done! My mother used to make throw pillows this way but I never got the knack. Thanks for the tutorial! I really like the fabric you chose. Great job! Wonderful tutorial, that material is beautiful, I am getting ready to make some pillows and I would love to have that material. Love pillows-I would say they are my biggest weakness!! My favorite fabric from online fabrics is the "bellini aqua jacobean"-it has all the colors that I love and I have in my home. I love pillows and all of these look so pretty! Waverly Santa Maria Desert Fabric has been speaking to me for about 2years! Love the fabrics that you chose for your pillows. I've had so much fun this week admiring the pillow styles and the fabrics that everyone used. I love the silver leopard design! Your tutorial is so easy to follow ~ thank you! There are so many gorgeous fabrics on their website. Oh I needed this because I need to make some for our couch! Wide Selection of Premium Clothing and Apparel Fabric Shop Fabric Online Today by the Yard Wholesale Fabric Pricing Available 1500 Fabrics Available! Online Fabric Store Pillow Tour and Giveaway!